Last week, the weather was perfect to start getting the lawns ready for spring (when it does finally arrive). Although the grass is not growing just yet, it does grow a little over winter, so to neaten it up we cut it very lightly. Using our John Deere 755, which has a grass collection system, we can effectively hoover up any debris such as leaves and cones from the lawns. As it has been so windy, the grass was lovely and dry, so out I ventured, wrapped up in several layers to keep warm, and mowed all our lawns. The previous day I had used a pedestrian rotary mower for the same reason on all our smaller lawns. Its always lovely to smell the grass cutting for the first time of the year. Even with 5 layers and a woolly hat on! 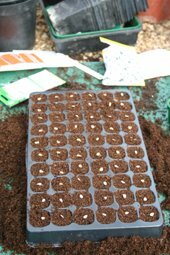 Seed sowing is continuing throughout March, as space becomes available in the heated propagator. This heat is required for germination in some seeds, but the greenhouse is heated so for many seeds, this is warm enough. Pictured is Osteospermum 'Glistening White' one seed per module, this was then covered with a very light dusting of compost. Thoroughly watered, the clear propagator top went on, then left on the greenhouse staging to its own devices. Around 10 day later we have over 100 healthy seedlings germinated, no need for the propagator top now, or you risk etiolated seedlings - long, leggy plants reaching up to the light. PS We have now renamed this variety to 'Gusting White', after Rachael misread the label. A far more interesting name, we thought. Nestled on the brick wall in the rose garden is a wintersweet, also known as Chimonanthus praecox. It is in a sheltered spot, and grown as a wall shrub for that little bit of extra warmth throught he coldest months. 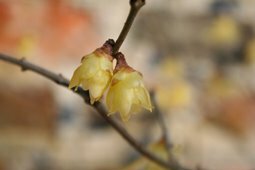 Once the sun has risen and warm the bloows, a delicious scent is carried on the air, a well chosen common name is wintersweet. Looking closer, the petals are almost translucent, so delicate they really don't look like they will withstand any frost, but they keep on flowering. This is the first year we have had a really good show on this plant, as they take a while to settle in, but after about 5 years, looks like there is no stopping it now! 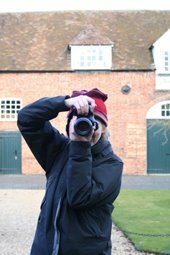 We had a visit by Sharon Pearson, a talented garden photographer who spent the afternoon with us snapping away. So I couldn't resist taking her photo, of course. We were very lucky to have one of those bright, crisp winter days, so hopefully the photos Sharon took will be fantastic! Well, it is now official. The Met. Office has announced it has been the coldest winter since 1996/97. After the last two weeks I can certainly believe it! 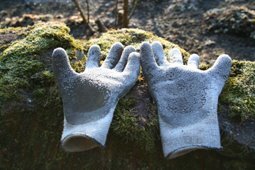 Barbaras gloves were left out overnight by mistake, and by the following morning were encrusted with shimmering frost - along with everything else. 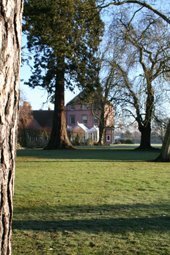 We have been waiting for the weather to allow us to prune our pleached lime walk, but hopefully this coming week will be milder, albeit forecast wet for the next week now. But what else would gardeners moan about, if it weren't for the weather!